Noted in Artscape Magazine as one of “Colorado’s top art spaces”, the John Deaux art gallery is located on the upper floor of the historic Turf Exchange building, an 1881 casino, dance hall and brothel. The sky lit, loft gallery showcases a large selection of original art by many of the region’s leading artists. 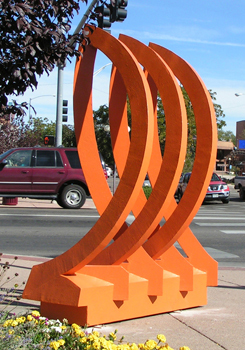 The gallery was founded in 1981 near Pueblo’s Broadway Street as the OFF Broadway Art Gallery. When current proprietors John Wilbar and Radeaux, movedthe gallery to the Union Avenue Historic District in 1989, they changed the name of the gallery to a combination of their names.John Wilbar currently specializes in design oriented, award winning, painted furniture and sculpture. 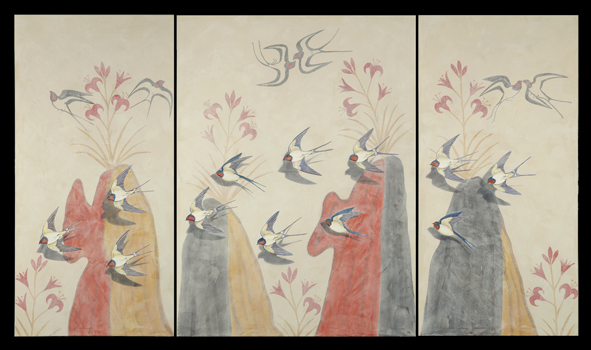 Radeaux, whose studio is in the gallery, paints birds and other life sized fauna with patterns and colors in a unique style that is becoming widely recognized and collected.The gallery exhibits a sizable selection of paintings by renowned master colorists John L. and Dorothy Mendoza. Master craftsman Joseph Kronwitter displays elegant wood inlay furniture and sculpture. Barbara Yaeger exhibits contemporary botanical watercolors and her daughter Ann Yaeger shows a range of exciting paintings that are studies of light, shadow and reflection. Meghan Wilbar, John’s daughter, is becoming known for her colorful, abstract expressionist oil paintings. Marilyn Leuszler, who studied in Japan for many years, paints traditional sumi-e of contemporary, local and western subject matter. Carolyn Hoyle exhibits large landscapes in oil and Edward R. Sajbel paints loose, almost abstract landscapes in watercolor. Renowned cinematographer & photographer John H. Johnson shows his mastery of the archival silverprint. The spacious gallery has many examples of all these artists’ works. The John Deaux art gallery has regular hours Tuesday – Saturday from 11 a.m. to 5 p.m. and on the first Friday of each month is open until 9 p.m.
On the street level of the Historic Turf Exchange Building, a notorious 1881 casino, dance hall and brothel, the Visual Art Center was founded in 2008. Select local artists rent wall and studio space in the facility. The John Deaux art gallery, upstairs in the building, oversees the operation of the Art Center and also has wall space downstairs. Classes by regional artists are available in the building.